Import your monthly MYOB Profit and Loss data to a flexible and easy to read Excel layout with the capacity to automate budget creation. The PL Compiler allows you to select the amount of detail displayed and use the data for performance review and budget formulation. It improves understanding of business operations, enhances budget development, and provides significant time saving in performance reviews and budget creation. 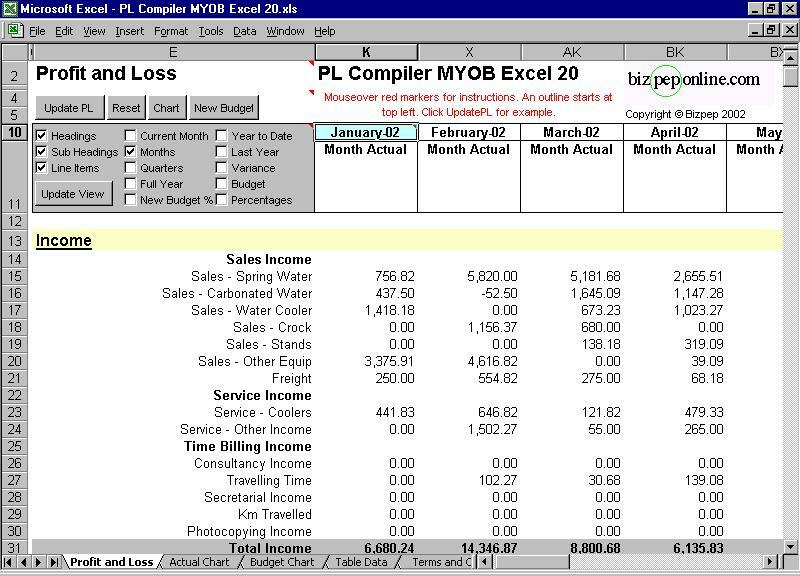 Format monthly MYOB Profit and Loss data, flexible review, automate budgeting. These include an improved understanding of business operations, enhanced budget development, and significant time saving in performance reviews and budget creation. Display view options include by Month, Quarter, and Full Year with Current Year, Last Year, and Budget values. Charts display both Actual and Budget values. IPCompiler is a system an network diagnosis Tool. Compile XLS to EXE, protect formulas,VBA. Copy protection with regkey/license. Qweas is providing links to PL Compiler MYOB Excel 30 as a courtesy, and makes no representations regarding PL Compiler MYOB Excel or any other applications or any information related thereto. Any questions, complaints or claims regarding this application PL Compiler MYOB Excel 30 must be directed to the appropriate software vendor. You may click the publisher link of PL Compiler MYOB Excel on the top of this page to get more details about the vendor.